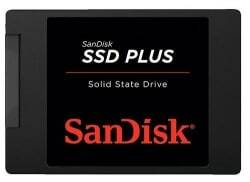 Triplenet Pricing via Amazon offers the SanDisk 120GB Plus SATA III 2.5" 6Gb/s Internal SSD for $22.22 with free shipping. That's $2 under our Black Friday weekend mention and the lowest price we've seen. (It's the best deal now by $3.) It features sequential read speeds up to 535 MB/s and sequential write speeds of up to 450 MB/s.